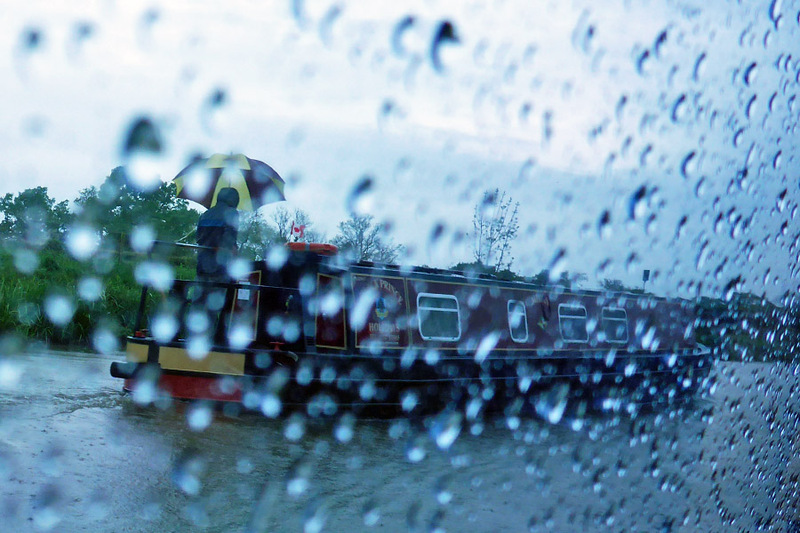 Sheep, rain and damned old fishermen #narrowboat #canal #England – The Diesel-Electric Elephant Company. A couple of mornings ago the sheep in the field next to the canal decided to explore beyond the confines of the fence. I spotted them just as they stumbled down the bank. Since there was no-one else about at the time I smiled, waved and ventured a cheery “Baaa… baaa…” intending to encourage them on their way. To a lamb they looked horrified, stared at me as though I had made disparaging remarks about the flavour of their chops and then stampeded back the way they’d come, returning to the familiarity of their field. To the best of my knowledge – and I can see their escape-gap from my desk – they haven’t been out since. What the hell had I said? Hello, darling – give us a kiss? Ooh you’ve got no coats on, you saucy things? It’s not the reaction that a veggie with a career spanning five decades hopes for. I didn’t feel comfortable sitting in the well-deck reading my book anymore, so I went back inside and put some trousers on. The weather here in Ingerlund has, of late, been archetypal. Very warm, cold, dry, damp, windy, still, bright, blue-sky, eight-eighths overcast and oppressively dull. I’ve had the stove lit in the early mornings when my nose has been complaining about the brass monkeys looking increasingly panicky, and then halfway through the later morning I’ve been throwing open the side-hatch like a mid-menopausal hot-flushy version of Juliet looking for a balcony. The gadies and lentilmen of the canals have been passing by under cover of some pragmatic solutions. A couple of boats have slipped past with their cratch covers zipped up so tightly that I haven’t been certain that the boats weren’t just out on their own. Mind you, when it’s been cool the cool has been damp cool – bone chilly cool. I daren’t look over the hedgerow to check on the sheep, but they’re probably all wearing clear plastic pac-a-macs and headscarves decorated with little red kisses or green frogs or some such. Yesterday morning dawned just that little bit more civilised. For a while at least. Certainly, the weather was clement enough for me to complete my usual dawn Zen Holistic Buddhist Chairman Mao Confuscius People’s Republic-recommended exercises designed to loosen my overnight chakra-knots and encourage my bowels to sing the Song of the Bear in the Woods. There’s just enough room on the rear deck so long as I use a slightly under-sized fan and don’t forget myself in the endorphin rush and try for a “Leaping Gazelle of the People’s Revolution”. I do so love exercise, don’t you? Stretching exercises were especially important, since I was expecting groceries. Oh, I don’t mean that I was sitting around eating gherkins and crabbing about swollen ankles and how patriarchally unfair [Mother] Nature is, I mean I’d ordered my groceries to be delivered from Messrs Sainsbury’s & Sons. Being blissfully road-vehicle-free in the era when no English supermarket has yet had the commercial foresight or customer-orentated chutzpah to have a “sail-through” aisle in their checkouts, home delivery is a boon. They do, however, insist upon a Brixandmortar address to arrive at, and the nearest one in my current case is the marina car park, about three-quarters of a decimal mile away along the towpath. £1 delivery charge and a one-hour slot is not to be sniffed at though, and I didn’t sniff at it. May I introduce you all to Igor? Igor is my trolley. Igor will allow me to drag along up to ninety kilos and he folds flat and stores in an especially-constructed little compartment in the galley. The blue boxes don’t fold flat, they hide out of sight in one of the “dead” corners under the galley sink. Igor helps me fetch my comestibles and gas bottles and fuel and things. Igor could do with being twelve inches bigger. He’s the biggest trolley available on the English interwebnets markets but, like most things, is still built for the feminine-physique mode, and requires a six-foot chap to hunker down at an “orang-utan” angle and gait when actually in use and not standing at rest next to a self-satisfied, deluded designer who has saved on material costs at the expense of functionality. Igor has fairly big wheels, and so Igor makes it possible to wheel ninety kilos of groceries along a rutted and uber-bumpy towpath (hunger also has a certain part to play in making such a project viable, since if I don’t wheel groceries, I don’t eat). Don’t tell Igor, but when I have the necessary moolah he is to be supplemented with a similarly large-wheeled “looks like it’s from an Arctic expedition” wholly dedicated shopping trolley. Maybe I’ll get them to breed? Suffice it to say that I shall feast on saladings and fresh, live vegetables (screaming in the pot) for the next week, after which it is back to the jars and packets and cans and rickets and scurvy. Later in the day I had a visit from an old fisherman. This is the chap who earlier in the week was gobbling up moorhens and moorhen chicklets on the opposite bank. He’d obviously had enough of the game and had developed a hankering for some fish brain-food. Fish-brains, for the bird-brains. Cheeky bugger was right on the Cardinal’s bow. He caught several unfortunates of the Piscean Nation, noticed me watching him and then flew off in a huff – beating my shutter-finger and the response time of my wee compact camera to it, but you can see the image anyway, since it’s so almost, and I’m not proud. I’ll get him next time. If you want to know what that confusion of ropes is, I mun ‘splain that the Cardinal hath but a single T-Post at his bow, and here I found need to tie two mooring ropes to it, which is why it looks a little crowded. The knots are a “dog’s dinner” and a “double-hitch half-clove canalman’s wotnot”. Look, I was knackered when I moored up, alright? We haven’t drifted loose since, so they must be holding nicely. If you’re so clever with ropes then may I suggest that you get knotted? As well as the wildlife, a well-fed chap’s sport is to be found in watching the world go by, both along the towpath (joggers, dog-walkers – dog-emptiers -, cyclists – lycra-louts – and other folk towing ninety-kilos of groceries, mumbling to themselves about recipes), and along the canal itself. One such brilliant sight was this vessel with a splendid-looking motorbike slung over the rear-end. It must be a bit of a fifty-fifty gamble though, getting the bike off the boat or getting it back into its rack. Neat job though, and well done. You can see that this was spotted during one of the “dry, sunny” spells of the recent meteorological mélange. I am sorely tempted, sorely tempted. I wonder what slinging a small, sporting Rolls over the rear-end would do to the Cardinal’s manoeuvrability in locks? The Cardinal and I have the option of a few more days lashed to this little piece of Cheshire before our fourteen days maximum is up, and I have things to do such as to finish the T-Cut & Polish on the accessibile side of the boat, check the engine over, watch a few clouds and, oh yes – do some writing. I also have to make a decision about direction and destination. This random meandering is all very well, but it does require a little forethought if I am not end up crossing the English Channel by mistake or heading out into the Irish Sea. Well, for the time being, anyway. So, there you have it, a few paragraphs about the domesticity of living on a narrowboat. Stove on, stove off, groceries click-click then lug-lug, wildlife coming out of my ears (must see a doctor about that) and motorbikes drifting by. It’s all go, you know. I wonder if it would tow my groceries? I shall have to investigate. Another entertaining and instructive post, Skipper. I am disappointed that there is the discord among the canal folks that you have described. Thanks for the update! I find your stories entertaining and enlightening. The enlightening part being all the grand use of slang and terms I look up and then pretend I already knew. I am not sure what you may have said to the sheep, but could they have sent the bird to foul you in some way. Maybe mess you up by causing you extra clean up work or by undoing your mooring rope. He has seemed to be stalking you. I was wondering are all the boats on the canal the same long boart style? Ron and I considered living on a houseboat in the past. We looked into a few and found some really neat steering / maneuvering systems. Some used water jets for maneuvering, some had small side propellers. Some had dual “driving” stations. You know it dawns on a laymen like me that the grocery stores could make some good money hiring boats to deliver orders. I think I would love the job as a supply boat owner such as you posted about before. I use to have a pickup. I investigated a hoist for the back of the truck. Other than ones for heavier weights needing a frame or stronger deck plate to fasten into they were easy to use, worked on DC voltage and came in sizes for everything. My friend put one in the back of his van for lifting up his scooters. I have seen them used for motorcycles. It is an idea as you could use it for other things you need to move back and forth from shore to boat and off again. Having run my motorcycles up a small ramp into the back of a pickup, having to have enough power to get up the ramp and stop suddenly enough to not hit the front of the bed, I agree it is not a good way to do it when older. How do, Sir. The canal system was almost entirely built for this desgin of boat, roughly 6′ 10″ beam and anything up to 72′ in length. These days there are “widebeams” (but they are limited as to where they can go) and there are some static houseboats (of the more usual houseboat layout). On a lot of the canals the locks are only just wide enough for a 6′ 10″ narrowboat. There are a lot of fibreglass cruisers that can and do explore the system. As with anywhere that humans congregate, there is much in-house fighting and bickering and group-hatred between (some) narrowboat owners, cruiser owners and especially widebeam owners! If we all lived aboard then services by boat could proliferate and thrive, but the licencing “authorities” don’t want live-aboards, they want a pretty-pretty cycle-walk-ramble path system with boats that only occasionally come out of marinas to act as “moving scenery”! Therein lies another elephant-in-the-room of disharmony (live-aboard boaters on the canals are generally despised by most)! That was one beautiful-looking motorbike though, I have to say. Solid, businesslike and well-proportioned. I want one! I wonder if you harness the sheep onto Igor you could have your own ‘huskies’ and sledge? Might be compliant as long as you haven’t got a taste for mint sauce (minus meat) it might work. Did that motorbike rest look like it might swing out and onto the canal path if moored up? Inventors take note! I love all this alternative domesticity – so how do you get registered at a GP practice if you are always on the move? More excellent photos!